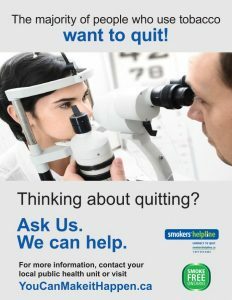 Optometry staff are in a unique position to identify early signs of oxidative and vascular changes in the eye as a result of smoking. Fear of blindness is of greater concern for most people compared to the fear of other smoking related conditions, yet the majority of smokers are unaware of the impacts of smoking on their eye health. 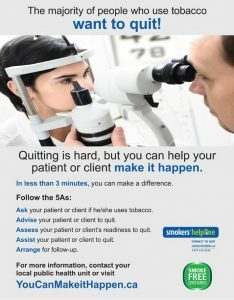 By providing brief advice to quit smoking, optometry staff can educate their patients on the effects of smoking on their eye health and how quitting smoking could decrease their chances of developing vision loss over time. Smoking and Age-Related Macular Degeneration: Review article. Make a tobacco-free property policy for the grounds outside of your office space by speaking to the property owner or landlord. 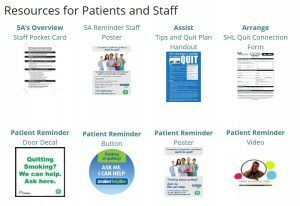 Clin Exp Optom – Raising awareness of blindness as another smoking-related condition: a public health role for optometrists?